This is just too precious. I guess I should accept that the Harry Potter movies really are coming to an end and that this isn’t a massive fabrication. I just watched a featurette of the last days on the Harry Potter set as the cast says their goodbyes (“We always knew we were coming back and this time we knew we weren’t”). This is the most emotional I have ever gotten during a behind-the-scenes video of a film set. Are you crying yet? If not, there’s more. The Harry Potter and the Deathly Hallows Part 2 premiere took over Trafalgar Square in London today. Daniel Radcliffe, Emma Watson, Rupert Grint, director David Yates, and J.K. Rowling took to the red carpet to thank fans for their dedication to the series over the years. The event was a lovely send off for the movies. There were speeches. There were a lot of tears. Emma Watson wore a gorgeous Oscar de la Renta gown. Rowling, overcome by emotion, may have even hinted at more Harry Potter to come. And cue more tears. Dammit, JK. The end begins next Friday and it will be completely weird for me once I finally get around to seeing the last movie. I better bring some tissues with me to the movies when I do; I’m gonna be bawling like a baby. 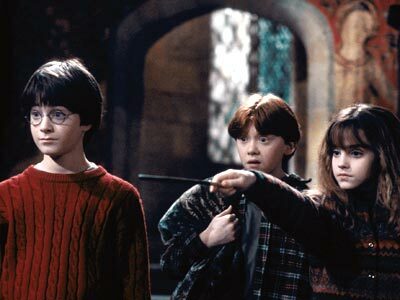 Who else is excited for the Harry Potter mania that is about the occur? Anyone suddenly nostalgic for all things Hogwarts? Sound off below. There aren’t really words to describe how it feels to grow up with a film franchise, especially one this good. All I know is I still haven’t quite accepted that it’s over. But as per usual, JK Rowling knows just what to say to make it all right. It feels like the end of my childhood (even though I’m 24). I was able to weather the end of the books because I knew the movies were still coming out, but I think I’m going to need tissues when I watch the last movie too!